Square Neck Tea Dress is rated 2.2 out of 5 by 6. A vibrant dress with an on trend neckline gives your wardrobe that pop of colour you need. 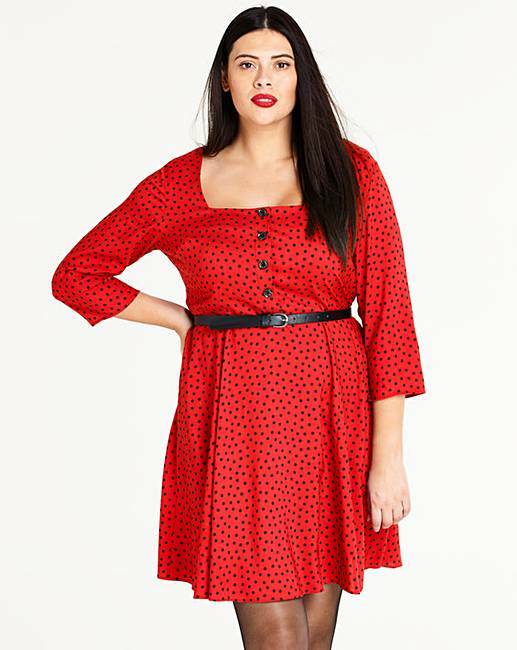 Simply Be design team recommend this with tights and ankle boots for the cooler mornings. Rated 1 out of 5 by Johnsy from Poor fit Lovely dress, good quality. But extremely poor fit around the bust area. The size 12 ordered was massive on bust and didn't sit properly at all. Very disappointed and returned. Rated 5 out of 5 by J9lewis from Love it Despite the bad reviews I ordered the dress and so glad I did. I love it. The fit was brilliant. Fits my curves well and makes me feel and look great. Brilliant price too. Rated 1 out of 5 by Amber from Huge disappointment! I bought this and the size is just terrible! Too tight on the waist and a huge bust! I'm clearly not the only one having this issues as the other reviews mirror my complaints. In addition the material is cheap and very clingy. Do yourself a favor and AVOID this product! Rated 1 out of 5 by MissL from Oh dear! What can I say! I purchased this with so much hope and I was very disappointed. It was absolutely huge on the bust (and I'm not exactly a flat chested girl!) Then it was ridiculously tight over my hips and stomach. The fabric was like an odd cheap cheese cloth and probably in the right light was very see through. Rated 2 out of 5 by AH09 from Belt not included... strange fit Lovely dress but the shirt section was a hit of an odd fit. It didn't hang very well once on and also the belt isn't included.